Product prices and availability are accurate as of 2019-04-03 13:56:42 EDT and are subject to change. Any price and availability information displayed on http://www.amazon.com/ at the time of purchase will apply to the purchase of this product. 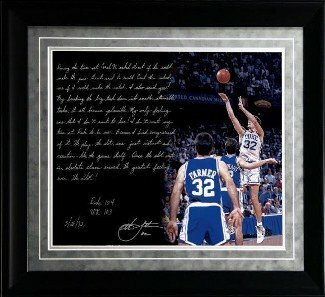 Christian Laettner Duke Blue Devils Unsigned-Facsimile 1992 The Shot vs Kentucky Framed Story PhotoSpecifications Size: 16 x 20 Package Quantity: 1 Excellent Quality. Great Gift Idea.